Rob Gronkowski and Conor Macgregor retire in the same week. 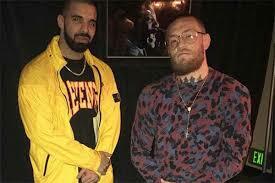 Drake is very disappointed he won’t have a friend in MMA anymore. It’s been a rough week for some fans of both the MMA and NFL, as a figurehead personality has retired from both. Rob Gronkowski, 29 years old and nicknamed Gronk,” is a now former tight end who played his entire professional career for the New England Patriots. On the MMA side, Conor McGregor is an Irish retired professional mixed martial artist and boxer. He is the former Ultimate Fighting Championship featherweight and lightweight champion. Both were well known for the skill in their respective sports and even more so for their personalities. Gronkowski officially retired on the 24th of March, 2019. He retired with an esteemed career of three career Super Bowl wins and five time all American tight end pro bowler. He’s been in the game since he was 20 with a relatively short career of 9 seasons. According to the Patriots official website, Gronkowski finishes his career with “100 starts in 115 games played, tallying 521 catches for 7,861 yards (15.1 avg.) with 79 touchdowns.” Aside from his skill in the game, Gronk earned his notoriety from his larger than life personality on the field, with footage often leaking of him joking with his teammates and hyping them up to succeed. Patriots fans will surely feel this loss in the next season with some publications already referring to Gronkowski as the best to ever play the position. Gronk still has yet to release an official reason for retirement instead choosing to address how grateful he is for his opportunities and colleagues in his last communication with the press. While Gronkowski has more of an Everyman appeal, Macgregor is infamous for being hot headed. His trash talk is the stuff of legend, getting into his opponents’ heads at press conferences whilst hurling insults at them. He made his debut in the UFC in 2013 and has 21 career victories, 18 of which were knockouts. Recently, his highly public boxing debut against Floyd Mayweather resulted in a loss after a usual round of his characteristic trash talking. He is also the only Irish UFC champion and is one of three fighters to ever hold the featherweight title, with his nickname “The Notorious.” Macgregor publicly retired on the 26th of March, 2019 via twitter, thanking his former colleagues. Senior Brandon Ottaviano is doubtful, thinking that Macgregor’s very public retirement is “a marketing scheme.” Brandon cited evidence of Macgregor claiming to retire a couple years ago. All that’s left to do is wait and see what the polarizing fighter will do next. A reason for retirement is unclear now, but days after his tweet claiming his retirement, it was released that he was under investigation for sexual assault accusations in Ireland.